Capoeira Angola - South London: Mestre Valmir's visit to London - nearing the end - Final 'Memorias da Gingibirra - RODA on Wednesday at FICA London. Mestre Valmir's visit to London - nearing the end - Final 'Memorias da Gingibirra - RODA on Wednesday at FICA London. Mestre Valmir has now been in london for a week. It all started with a great roda at the YMCA to celebrate the 20th of November. Mestre Joaozinho came to visit as did many other capoeiristas. Wednesday saw the first class in FICA london which also went well - Mestre Valmir gave us all individual feedback. Not always easy to take but very important! This was quickly followed by a music class. Valmir's focus on music is well known as is his ability to improvise. He pased on lots of tips and suggestions on how to improve our singing and music. Music being perhaps the hardest part of Capoeira to teach and learn outside Brasil. On Friday, as ever, we had a great roda a Joazinho. On Saturday in the thanet class went well. On Sunday Mattias Assuncao gave a lecutre about Palmares and Zumbi. This was a great opportunity to hear some of the facts and different interpretations of Palmares and Zumbi communicated to us in a simple, clear and effective way. Its great how Mattias manages to link historical facts and narratives with modern myths and politicals perspectives. All in all a great oppotunity. In the end the instrument making class took place at home! 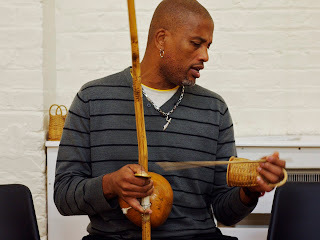 A berimbau and a number of Caxixi's were made. All very beautiful. As usual yesterday saw the last class with Valmir in the YMCA - which was great. We will make sure to carry on some of the movements in classes next week and beyond. On wednesday is the final roda of Valmir's visit. 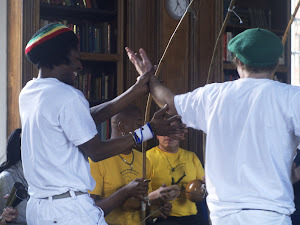 Its the Monthly Roda 'Memorias da Gengibirra' that FICA and South London Capoeira do together. It will take place at FICA london.